The Embassy Suites Williamsburg hotel in Williamsburg, Virginia is centrally located to all the excitement and history the area has to offer. Our Embassy Suites hotel is just minutes away from: Colonial Williamsburg, Busch Gardens, Water Country USA, College of William and Mary, Prime Outlets, Historic Jamestown, Historic Yorktown, Over a Dozen Fantastic Golf Courses, Go-Karts Plus.Adventure awaits you in Williamsburg, Virginia - a great place to stay, play and shop.Embassy Suites Williamsburg Hotel Features Include: Complimentary cooked-to-order breakfast with a large variety of great tasting options. Our buffet includes breads, fresh fruit and delicious hot breakfast items. It's convenient to just grab something on-the-go or sit down for an omelet, just the way you like it. Manager's reception where you can relax with snacks and your favorite beverages each evening. Complimentary wireless high-speed Internet access throughout the hotel. Atrium Caf eatures American cuisine. Pizza Hut is also available in the Atrium Caf r directly through room service. A well-equipped fitness center, indoor pool and hot tub where guests can keep a good health regimen. 1,000 square feet of flexible meeting/banquet space. A perfect match for any of your small meetings. 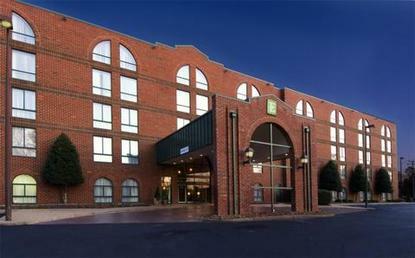 Convenient 24-hour business center.Embassy Suites Williamsburg Hotel Guest Rooms Feature: All new two-room guest suites. We are the only full-service, all-suite hotel in Williamsburg, Virginia. Complimentary wireless high-speed Internet access throughout the hotel. Fully equipped with two televisions, a refrigerator, microwave oven, coffee maker, two telephones with data ports and a well lit dining/work table. Disney and in-room pay movies.